Tarja Trygg, of Finland is mapping out the sun all over the world. In her amazing pinhole project, she sends her pinhole cameras all over the world to record the paths of the sun all over the world. led by the inventors of this unique photographic technique, Slawomir Decyk, Pawel Kula and Diego Lopez Calvin. They called this kind of images "Solarigraphics" which come into being in cameras without lenses and light-sensitive material is exposed in such a way that the image is revealed directly, without the use of further chemical processes. Solarigraphy and heliography mean Photography of the Sun. I prefer to use the term in English "solargraphy" because "solar" means Sun and in my native language Finnish, I use "solarigrafia". Solargraphy is a photographic method for recording the paths of the Sun. The most famous of my solargraphs has been exposed for 180 days in Helsinki. It can be seen on the web gallery of Solaris, too. Image left: This solargraph is the result of a six-month exposure of an area in Helsinki taken with a self-built pinhole camera from a balcony. In 2003 I wanted to see solargraphs with half a year exposure time or for 180 days. Solargraphy by Tarja Trygg. The solargraph received considerable public attention of taking published in the notable daily newspaper called Helsingin Sanomat on March 23rd 2004. The image was placed in the pages on Science & Nature. This solargraph has spread all over the world via Internet, too. In the same year Serbian Photo Magazine REFOTO June 2004 published it in the second part of the article about Pinhole Photography. It included three of my solargraphs. The original print has been exhibited in Helsinki, Finland, and in Wellington, New Zealand, in 2005. Why do so many people regard the solargraph as amazing? Solargraphs are unusual photographs, taken by means of a pinhole camera. We are not used to see this kind of image with our naked eyes. The weather during half a year can be re-coded into a single image. The sun’s slow path across the sky is beautifully captured by this unique process. Its peak is reached during midsummer on the 21st of June in the northern hemisphere. Every day the Sun leaves one line after one. The tracks of the moving Sun are visible and increase progressively from December through to June. The missing tracks are due to the Sun being obscured on overcast days. What else can be seen in the image? There are the ghosts of the cars in the parking place. Several cars have been parked in the same places one day after another during the long exposure and so the cars have merged into one model or the arch type of the cars. taken by Louis Jacques Mandé Daguerre (1787-1851) from Paris where a shoe polisher is working but all the pedestrians have disappeared from the crowded boulevard. The exposure was one day of about eight hours. Nowadays people are used to see frozen moments in photographs but in solargraphs the exposures are extremely long which often last months, from one day up until half a year, recording the tracks of the Sun. Solargraphy is a new approach to photography and it can be defined as an "anti-technological" means of photographic expression. 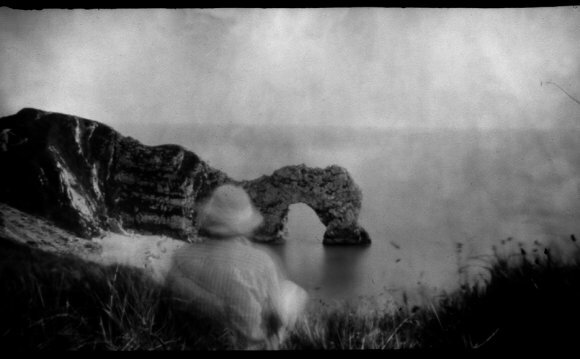 With the simplest pinhole camera the tracks of the sun can be caught on an emulsion of photosensitive materials as a piece of black and white photographic paper. Solargraphy is an ecological way to take photographs. In that the photographs are neither developed nor fixed in any way. Light may cause the darkening of photosensitive emulsion and eventually for the images to disappear. It sounds unbelievable but all the tracks can be safely viewed only in dimmed light after exposing. Solargraphy discovers the surprising results achieved by the pinhole cameras. Solargraphy is a reality in itself. The Sun burns the traces of reality on the emulsion. Solargraphy can be called the Art of Pinhole Photography and Space-time Art, too. Was Brighton Pride parade delay due to pinhole camera?